Walk inside the doors of The Strater Hotel in Durango, Colorado and open a world of living history that becomes part of every visitor’s personal story. The Strater is a complete experience where guests tour through pristine, interesting halls and stay in rooms restored to 1887 glory. Every detail — from amazing antique Victorian furniture to meticulous Barbury wallpapers — holds the stories of the southwest which began in 1887 and continue today. 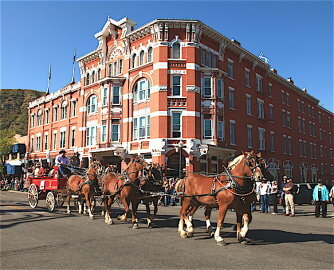 A founding member of Historic Hotels of America - The Strater is Durango’s living history museum. 93 unique storied rooms; the Henry Strater Theatre; The Mahogany Grille; The Office Spiritorium; and The Diamond Belle Saloon are all steeped in craftsmanship at every level. From fabulous food to creative drink; shadow boxes that tell stories of the past; and the Strater team’s genuine connection to every guest all within the iconic brick building in the heart of downtown Durango! The Diamond Belle (known as “The Belle” by the locals) brings saloon girls and Victorian-era bartenders together with guests as they Belly Up to the historic bar and listen to both talented ragtime pianists and the best of today's music scene. In the summer, wild west gunfight reenactments entertain tourists just outside the Belle’s swing doors. The Office Spiritorium is the local’s favorite for happy hour and late night. Experience that ambiance of the Victorian Old West as we serve you an array of eclectic culinary specialties. The very definition of "Farm to Table"
The Henry Strater Theatre is the perfect place for entertainment. From music to theatre to comedy and more! Weddings, Business Meetings, Multi-day conferences and more. Call Strater Catering & Events at 970.385.1887 and we will work with you to create the perfect event.